1.What is method overriding in java? Method overriding is type of polymorphism in java which is one of the main object oriented feature. Redefined the super class method in sub class is known as method overriding. method overriding allows sub class to provide specific implementation that is already defined in super class. Sub class functionality replaces the super class method functionality (implementation). 2. Can we override private methods in java? No. Its not possible to override private methods because private methods in super class will not be inherited to sub class. ReadCan a private method in super class be overridden in Sub class? 3. Can we override static methods of super class in sub class? NO.Its not possible to override static methods because static means class level so static methods not involve in inheritance. 4. Can we change the return type of overridden method in sub class? No. Return type must be same in super class and sub class. 5.Can we change accessibility modifier in sub class overridden method? Yes we can change accessibility modifier in sub class overridden method but should increase the accessibility if we decrease compiler will throw an error message. 6.What happens if we try to decrease accessibility from super class to sub class? 7.Can we override a super class method without throws clause to with throws clause in the sub class? Yes if super class method throws unchecked exceptions. No need if super class method throws checked exceptions. But it is recommended to add in sub class method in order to maintain exception messages. 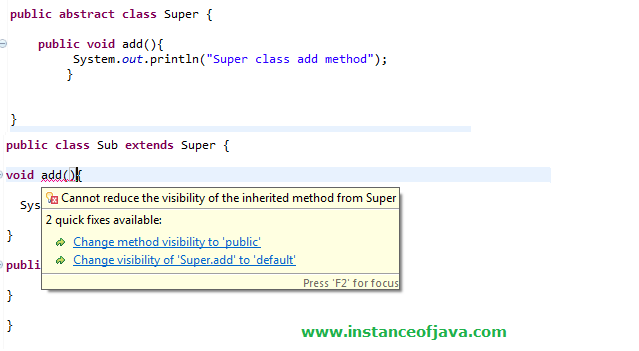 8.What are the rules we need to follow in overriding if super class method throws exception ? 9.What happens if we not follow these rules if super class method throws some exception. 10.Can we change an exception of a method with throws clause from unchecked to checked while overriding it? super and sub classes are same types not different.